New York City has a bit of a tortured history with its commuter rail lines. Although some LIRR stops in Queens are among the system’s busiest, unlike in many other cities (I’m looking at you, Paris), the commuter rail lines do not act as a rail option for a significant portion of New York City commuters. This is largely a function of two factors — cost and frequency — but more on that shortly. The department has tapped engineering firm AECOM to look at potential changes that would boost ridership on Long Island Rail Road and Metro North lines running within the five boroughs. Reducing fares within city limits, for example, would entice more residents to use commuter rails like the subway system and connect more neighborhoods to transit hubs like Grand Central Terminal and Penn Station in Manhattan, Atlantic Terminal in Brooklyn and Jamaica and Woodside stations in Queens. “AECOM is under contract to … investigate service and policy strategies for the city zone of the commuter rail network to connect residents to more frequent and affordable regional rail service, and potentially reduce crowding on nearby subway lines,” a spokesman for the department said in a statement. In particular, the de Blasio administration has floated the idea of running trains more frequently between Atlantic Terminal and Jamaica Station so Queens commuters could then transfer to a number of subway lines at the Brooklyn hub. The study will cost DOT $787,000, but I’ll do it for half that. Any changes, of course, would have to be implemented by the state-run MTA. Now, it’s all well and good to explore ways to get more New Yorkers to use rail lines that stop in the city and serve Midtown, but the equation is a simple one. Run trains more frequently; rationalize the fares; stop treating commuter rail lines like some plush luxury service for suburban commuters; and for the love of all that’s holy, figure out how to connect Grand Central and Penn Station and develop a plan for through-running. In essence, use pre-existing infrastructure and some new build to create an RER-style network. Sure, suburban riders more throw a fit over Those City People riding their trains for less, but a rational distance-based fare would encourage city riders. Plus, Penn Station Access is designed to do just that anyway when and if it sees the light of day. In fact, this very plan was recently suggested by Alon Levy as an April Fools joke which tells you everything you need to know about transit planning in NYC. And yet, as noted in Anuta’s piece, the scope of the city’s imagination seems to be limited to a frequent Jamaica-Atlantic Terminal shuttle that simply moves commuters from one subway station to another. A rationalized fare with frequent service could help move Queens residents to Lower Manhattan and open up Downtown Brooklyn, but that seems far too limited in scope and potential. Think big; think network. Someone around this city should. Meanwhile, the MTA’s own internal effort at building NYC-based commuter rail ridership is running into political problems as city pols think the MTA’s Freedom Ticket pilot is going to fail by design. The pilot may permit city riders to access only Atlantic Terminal and not Penn Station, and thus, riders would not save time or money. Who needs best practices and an integrated rail network when you have…New York City practices? In what has seemingly become a regular rite of passage for the region’s commuter rail lines, the MTA yesterday announced record ridership on both Metro-North and the LIRR for 2015. Metro-North saw 86.1 million customers last year, and the LIRR carried 87.6 million customers, the highest total since 1949. Metro-North’s ridership has doubled since the agency came into being in 1983. Interestingly, the MTA notes that Metro-North’s gains in non-commuter trips is increasing faster than its regular commuter base, and the railroad reports that its stations west of the Hudson are seeing higher spikes in ridership than those to the east. The Port Jervis Line and Pascack Valley Line saw gains of nearly 5 percent. Meanwhile, the MTA notes that ridership should continue to increase over the next six years when the East Side Access project comes online, and Metro-North begins service into Penn Station shortly thereafter. Gov. Andrew Cuomo’s main line expansion project as well as local pols’ push to introduce a Freedom Ticket could lead to higher ridership numbers as well. It’s all part of an improved mobility picture for the New York region. Now how about that capital funding? We spend a lot of time talking about where New York City’s transit system goes and how it could be better, but we don’t spend too much time talking about where the transit doesn’t go. We know how current service could be improved, and we all have fantasy maps regarding planned service extensions. But we don’t always address the so-called transit deserts where transit riders have few options and commuters face long rides to job centers. At a time when affordability is a buzzword surrounding the political discourse in the city, these transit deserts stick out like a sore thumb, and last week, Ydanis Rodriguez, head of the City Council’s transportation committee, held a hearing on improving access. From light rail to ferries, the speakers ran the gamut of topics we’ve discussed over the past few years, and those facing questions responded adeptly. For instance, DOT Commissioner Polly Trottenberg spoke about how light rail involves more than just tracks and a line on a map; it involves, she explained, the need to invest in the infrastructure behind light rail and create a sustainable network. One idea though that has come up time and again over the years involves commuter rail access through New York City. When I was in Berlin and Paris this past summer, I had the opportunity to ride both the S-Bahn and RER trains, and for someone used to New York City’s concept of commuter rail, the European model is eye-opening. These trains enjoy the benefits of through-running through center city areas, and the fare structure is rationalized to encourage both intra-city and city-to-suburb travel. It didn’t cost me more to take the RER a few stops than it would have to make a similar trip on the Metro. Here, the LIRR and Metro-North do not share a fare structure with each other, let alone with New York City Transit, and those who board commuter rail lines within New York City pay a much higher — and often cost-prohibitive — fare. If our politicians have their ways, this practice would end, and riders would be able to use commuter rail trains within the boroughs for a much lower cost. The city is pushing aggressively to make this happen, and one MTA Board member is embracing the cause. This debate of course gets to the heart of the conflict between the suburban-focused commuter rail and the city-centric subway system. Do suburban riders want city passengers hoping on board their commuter trains for a few stops? Do suburban riders want to see their trains slowed in order to make more stops to better serve inaccessible areas? Can MTA agencies work together on rational fare policies? These are questions that hit at the very essence of the MTA’s regional approach and haven’t been satisfactorily addressed in years. I expect this conversation to continue, especially as the MTA looks to reactivate certain LIRR stops in Queens and bring Metro-North into Penn Station via the Penn Station Access plan. Eventually, we have to move toward a European model. But can we get there without unnecessary kicking and screaming? We’ll find out soon. (Updated at 9:30 a.m.): Six people are dead and 15 injured after the deadliest accident in Metro-North history. Shortly after 6:30 p.m. on Tuesday evening, Metro-North train number 659 traveling north from Valhalla struck a black Jeep Cherokee that was, by some accounts, stuck or at least stopped in the at-grade crossing at Commerce St. near Kensico Cemetery. The driver of the car who was not in her vehicle at the time of the collision is among the dead as the force of the commuter rail pushed the Jeep nearly 10 train car-lenghts forward, and a fireball engulfed the train. “This is a truly ugly and brutal sight,” Gov. Andrew Cuomo said in a press conference a few hours after the collision. The National Transportation Safety Board has already announced that it will investigate the accident, and the federal agency plans to review the MTA’s signaling and gate system at at-grade crossings. I’m familiar with that intersection as I have family members buried in Kensico. It’s a very tight and blind curve heading north on Commerce St. into the intersection with both the Metro-North tracks and Taconic. For now, Metro-North and its investigators are not clear on the sequence of events, but Westchester County Executive Rob Astorino indicated that preliminary examinations indicate that the Jeep driver was likely at fault. One report notes that the crossing gate came down on top of the Jeep before the collision and that the driver exited her car to investigate what struck her car, apparently unbeknownst to her, a train barreled down. Passengers were evacuated through the back of the train. About 400 of them were taken to a local rock-climbing gym for shelter, where buses were to take them to the next working station, said Aaron Donovan, a spokesman for the authority. One passenger, Scott Miller, 45, said he was riding in the second car of the train when he heard a bang. “The train screeched to a halt, and you immediately started smelling smoke,” he said. “People started screaming, ‘Run to the back of the train,’ ” he said. For Metro-North, this is another in a series of recent fatal accidents. It’s their first since the December 2013, but that’s small consolation as the commuter rail’s safety practices have come under fire over the last few years. This one, at least, seems to have been outside the control of those driving the train, but serious questions about how the third rail was able to pierce so much of the rolling stock and whether evacuation options are sufficient remain. When you or I think about a drill bit, we probably conjure up images of something small used to secure some houseware to the wall, maybe 3/4 of an inch. 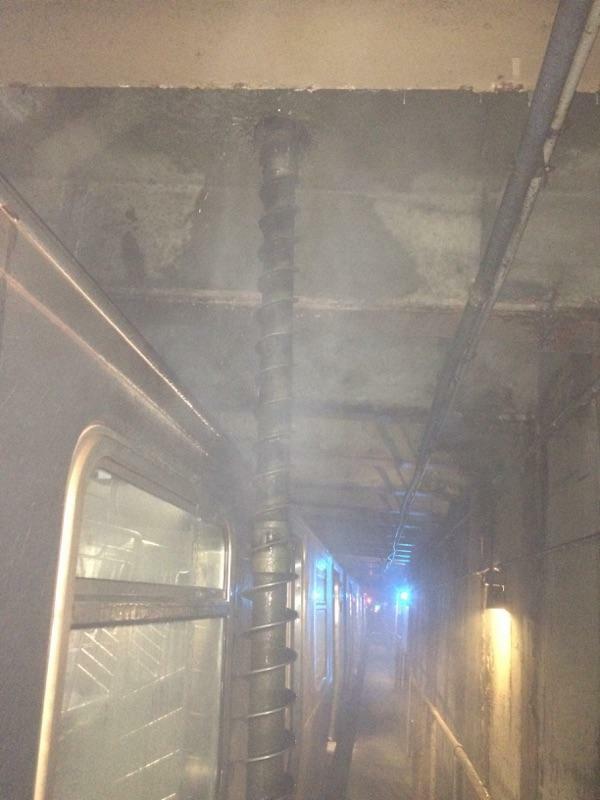 We don’t really think of drill bits on the scale of the East Side Access project, but today, numerous subway riders and the MTA had a close call with a giant drill bit as it pierced a subway tunnel and narrowly avoided an F train with 800 on board. …A contractor working on the Metropolitan Transportation Authority’s East Side Access project, which will connect the Long Island Rail Road to Grand Central Terminal, was operating the drill above ground, roughly at the intersection of 23rd St. and 41st Ave. in Long Island City. This comes at the end of the week during which the MTA David L. Mayer, formerly of the National Transportation Safety Board, to be the agency’s first Chief Safety Officer. It also comes at the end of the week during which the NTSB ripped into Metro-North, calling last year’s derailments, injuries and deaths “preventable.” For more on that — and criticism lobbed toward the FRA as well — check out Railway Age’s take and The Times’ piece on the press conference. Much like the drill bit exiting the tunnel today, the only way to go from here is up. It’s hard to say which transit agency has had a worse go of it lately. New Jersey Transit had some banner years in 2012 when Hurricane Sandy knocked out hundreds of millions of dollars of rolling stock and followed that up by being unable to cope with greater-than-expected crowds during the 2014 Super Bowl. Meanwhile, Metro-North has been plagued by derailments, collisions and deaths over the past 16 months. It’s not been a good look for either. O’Connor came under intense public scrutiny in 2012 after Superstorm Sandy flooded hundreds of NJ Transit rail cars and locomotives that had been left to sit in low-lying, flood prone rail yards. Documents and emails revealed that NJ Transit did not follow a plan to move the equipment to higher ground, and instead left the rail cars and locomotives in the vulnerable yards in Kearny and Hoboken as Sandy approached. The damage to the equipment was upwards of $120 million. O’Connor, according to Rouse, will replace John McNulty, a vice president at Metro-North, who is retiring this year. Over the past year and a half, we’ve seen O’Connor’s name pop up in the ongoing coverage of New Jersey Transit’s response to Sandy. He repeatedly excused planning that left expensive rolling stock in flood zones and shortly after Sandy, got into a war of words with some of the agency’s critics over NJ Transit’s seemingly inept response to the storm. Yet, transit is incestuous in the northeast, and O’Connor, a few weeks after getting ousted from the Garden State, has landed with New York’s troubled agency. Maybe it’s a fit for both, but it’s certainly reasonable to eye this development skeptically right now. In a scathing report concerning Metro-North’s recent safety troubles, the FRA accused the railroad of prioritizing trumped-up on-time performance over everything else, including safety, and urged the agency to make top-to-bottom changes to ensure the accidents we’ve seen over the past year do not become routine. The report comes just over three months after the fatal Spuyten Duyvil crash and a few days after a train struck and killed a worker on the Park Avenue viaduct. Transit advocates embraced the report’s recommendations. “Metro-North Railroad must act promptly and decisively to put its operation in order,” Metro-North Railroad Commuter Council Chair Randolph Glucksman said. The MTA has until May 17 to submit a safety plan, and the feds plan to meet with Metro-North officials next month to begin planning. The public’s trust in Metro-North, once the shining star amongst New York City’s commuter rail lines, depends upon it. Update 4:45 p.m.: All Metro-North service to and from Grand Central has been restored, the MTA has announced. The Park Avenue viaduct is safe and sound, and service on all four tracks and all three Metro-North lines is running. The agency notes, however, that “trains will run at reduced speeds through the collapse zone to protect nearby employees and reduce vibrations as rescue and recovery work continues.” Expect crowding and delays during the evening rush hour. MTA Metro-North Railroad is restoring some New Haven and Harlem line service from Grand Central Terminal after an explosion and building collapse next to Metro-North’s tracks running above Park Avenue. Customers who use the Hudson Line should take the B, D or 4 subway lines to 161 St and walk to Metro-North’s Yankees – East 153rd Street station. Metro-North structural engineers have verified the integrity of the Park Avenue elevated structure. Two of the four tracks on the structure – the two farthest from the explosion site – have been restored to service after being cleared of debris, inspected for track and third rail integrity and approved for operations by Metro-North and the New York City Fire Department. As more tracks are restored, the level of train service will increase. Train speeds may also be reduced to protect nearby railroad workers and to limit vibrations at the explosion site. New Haven Line and Harlem Line customers should expect crowding and delays due to track limitations, with some local and express trains combined. The track configuration does not allow Hudson Line service to operate to and from Grand Central until more tracks are restored to service. Customers are urged to delay travel until later if possible. The subway system is cross-honoring Metro-North tickets, and the Port Jervis and Pascack Valley Lines are cross-honoring Hudson Line tickets. More as service is restored. Southbound customers from the New Haven Line and Harlem Line will get off at the Harlem Line stations or Wakefield or Woodlawn for a short walk to the No. 2 for service to Manhattan. Customers can transfer to the No. 5 at E. 180th Street for East Side destinations. Northbound customers for all Harlem and New Haven Line stations should take the No. 5 subway to East 180th Street and transfer to the No. 2 subway north to the 233rd Street Station, where they can walk a short distance to the Metro-North’s Woodlawn Station. Hudson Line customers should take the No. 4 to 161st Street Station (Yankee Stadium) and walk west to Metro-North’s Yankees – East 153rd Street station for service to points north. The D subway also goes to 161st Street. Southbound Hudson Line customers will go to Yankees-East 153rd Street and transfer to the No. 4 or D subways, or to Marble Hill and transfer to the No. 1 subway at 225th Street, an elevated station. According to the MTA, there are currently no stranded trains, but power has been cut to the third rails of all four tracks near the explosion. 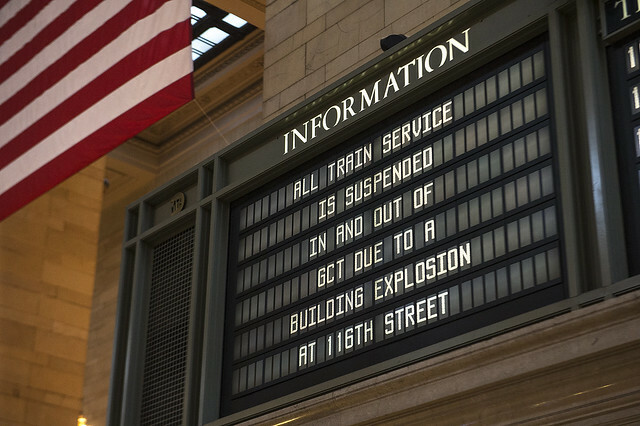 The MTA urges customers to “consider limiting travel today if they can,” but as the explosion occurred at the tail end of rush hour, most commuters were already in the city this evening. It’s not clear that this situation will be resolved by the evening rush, and I’ll update this post as more information becomes available. As a new year dawns, it’s become an annual tradition these days for commuter rail lines in New York City to announce record ridership numbers and continuing growth. Metro-North, the Long Island Rail Road and New Jersey Transit have seen numbers not matched since the age of the automobile dawned, and with congestion in the region worsening and gas prices rising, this is a trend with upward growth that shows no signs of slacking off. New Jersey Transit has dozens of double-decker trains that fit through tunnels under the Hudson River. The problem is the number of tunnels: two. Spokeswoman Nancy Snyder says those two tunnels carry all of the Amtrak and commuter train traffic between Manhattan and points west. O’Grady’s piece drills down on each railroad’s challenges, and we know that New York City is constrained in that Manhattan is an island. But while the situation is dire, there is some faint glimmer of hope for certain commuters. First, East Side Access may eventually open, bringing more riders on the LIRR and better distributing them throughout the city. The Penn Station Access plan could follow which would help Metro-North. New Jersey Transit, though, in the ARC-less present, is relying on Amtrak’s Gateway Tunnel to remove some trains from the Hudson River bottleneck, and it’s not clear when, if ever, that tunnel will become a reality. We can wring our hands over ARC and the missed opportunities, and we should be worried that few in Albany and Trenton are actively seeking a solution to this capacity problem. We should discuss through-running at Penn Station to bolster capacity as well. But because of geography, politics and economics, these capacity concerns represent a problem that won’t soon disappear.